Because of your blood donations, Cassi is able to enjoy her life as a teen. Her hobbies include drawing, tennis, and singing with her high school choir. The one hope Cassi has is to finish her senior year and graduate with friends. During the spring of 2015, Cassi began to feel increasing pain in her left hip. By autumn, the pain had manifested itself all the way to her left shoulder, where a golf-sized lump appeared. While the lump was being surgically removed, Cassi learned she had Ewing Sarcoma, a soft tissue and bone cancer. The fast moving disease had spread from her hip, into both lungs, and even externally onto her shoulder. 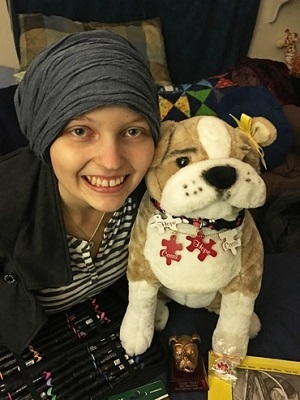 Thanks to chemo and radiation treatments, a positive attitude, love from friends and family, as well as the power of prayer, Cassi is doing the best she can. She goes to the hospital for whole blood and platelet transfusions on a regular basis. Your generosity as blood donors is something Cassi never takes for granted. Let’s help Cassi get to that moment of taking selfies in a cap and gown with all her friends come her high school graduation day. Donate blood today and help Cassi and patients like her go on to achieve great things!